Contrary to popular belief, golf is not a cushy pastime. Until I began to play golf myself several years ago, I never really appreciated how hard golf can be on a person’s body. Watching professionals play so well with so little visible effort on television is misleading: The true rigors of the game are not apparent. More than 80 percent of professional golfers report a golf-related injury at some point in their career. An estimated 10 percent to 33 percent of professional golfers are playing while injured at any given time. 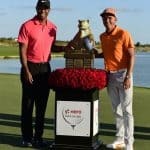 When the injured pros do return to the tour, nearly half are still bothered by their injuries, but return nonetheless. The injury rate was higher for amateur players over age fifty. The typical injury forced the amateur golfer to miss an average of more than five weeks of playing time. The most common injury sites to amateur golfers included the lower back (35% of injuries), the elbow (33%), and the wrist/hand (20%). And Ladies, don’t think that injury is a guy thing—the surveys show the injury rates for men and women are identical for both professional and recreational golfers. Professional golfers usually sustain their injuries from the sheer number of swings they take each week. Mis-hits (such as hitting the ground or a rock) also are a significant cause of injuries for professional golfers. But why do amateurs get hurt playing golf? We aren’t professionals. We don’t practice 10 hours a day, as the pros do. Ah, but we do practice. And furthermore, our swing mechanics are often faulty, placing more strain on our (out of shape) bodies than professionals, with their more efficient “grooved” swing, experience. 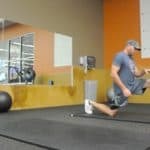 Now, throw in the fact that amateurs tend to neglect the importance of a proper warm-up routine, and your have Dr. Divot’s Recipe for Injury. Put it all together and it starts to make sense—it’s not just bad luck that causes those sore lower backs, tender elbows, or achy shoulders. The good news is that these factors are for the most part within the control of the amateur golfer. Get into the habit of regular exercise that involves strengthening and stretching of the many “golf muscles”. This need not involve joining an expensive health club and hiring a personal trainer named Klaus. Simple workouts a couple times a week with light weights will do just fine. Don’t overdue it. Yes, it is tempting to go out and play three rounds the first weekend the snow melts, or to hit six super-jumbo buckets of balls at the range. Remember, though, that rest is the best way to prevent a minor twinge from becoming a season-ending injury. 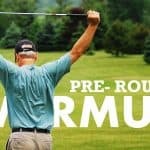 Take a few minutes before each playing round or practice session to go through a proper warm-up. Unfortunately, most recreational golfers think that the first three holes of their round is the warm-up! Get some lessons! Faulty swing mechanics not only make for a bloated golf score—they place added strain on our bodies. A qualified teacher will help lower your score and make you less prone to injury. Try to keep these pointers in mind—and have a happy and healthy golf season! Attention Lady Golfers: Beware of the Injury Bug!All Hot Golfers Get “Warm” First!